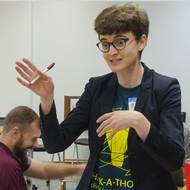 By diligently working to remove barriers for people with disabilities on the Texas A&M campus, Bara Safarova, a doctoral student in architecture, was honored at the 2018 ACE Awards. an annual event recognizing the importance of campus diversity. Texas border region residents will soon have access to two specialty medical clinics converted from shipping containers by students at the Texas A&M College of Architecture. 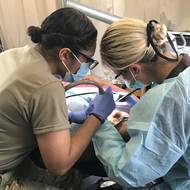 Outside a pop-up medical clinic in south Texas, a wide-eyed woman stood in shocked silence, suddenly able to see the world in sharp focus for the first time after receiving a pair of glasses in an initiative coordinated by military reservists and the Texas A&M Colonias Program. The Water Filtration Training Academy in Laredo, TX, was inaugurated February, 6, 2015. The first cohort, 3 individuals from Monterrey, N.L., completed training. Also, the Rotary Club presented Rueda de Medicina, their first ceramic water filter press.